We think of tooth staining and decay as a food-related issue, but really the things that we drink play just as much – if not even more – of a part in our oral health than the foods that we eat. 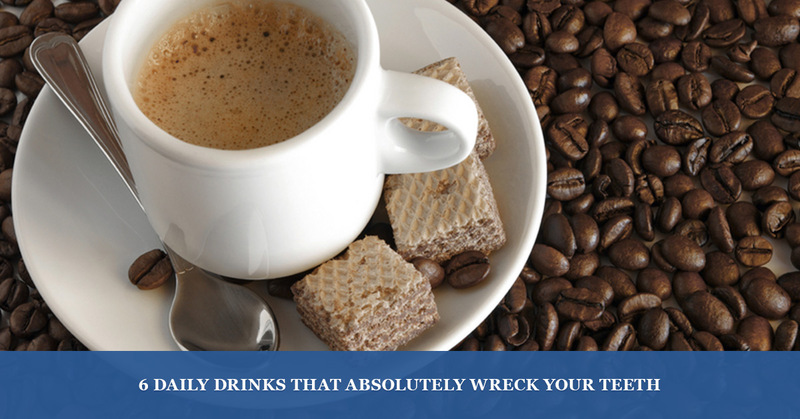 Find out if your favorite drinks are actually destroying your teeth in today’s blog from Balboa Victory Dental, your trusted Encino dentists. Before we dive into the top enamel-weakening drinks that you almost certainly already enjoy on a regular basis, it is important to note that we understand that nobody is perfect; even if you do drink some of these damaging fluids, you can undo quite a lot of damage by simply brushing and regularly visiting your dentist. While this one is a bit obvious, soda is a great starting point for damaging drinks because it is so impressively destructive. In fact, a single soda is just about as bad as drinking everything else on this list, especially if that single soda is an ice-cold dark cola. These highly-sugary beverages contain damaging carbonation, bacteria-inducing sugars, enamel-diminishing acids, include staining colors, and are served cold, which is pretty much all of the no-nos for your teeth. Fruit juice is commonly touted as a healthy alternative for soda, but most of the time is not. While there are cold-pressed or fresh-squeezed juices that offer a great amount of vitamins and minerals, most juices are comprised mostly of acid, water, and sugar. In fact, the average glass of orange juice contains more sugars and acids than a can of soda, which essentially undoes all of the benefit you gained by brushing first thing in the morning. In general, fruit juices are not a healthy thing to consume for your teeth, but rather just a non-carbonated sugary drink. While we’ve talked a lot about the effects of cold, scorching hot things aren’t great for your teeth either. While our teeth are far more adapted to warm drinks than they are too cold, hot beverages are another thing altogether; in fact, any major temperature change is likely going to harm your tooth’s enamel. Since your enamel serves as the protective barrier for your tooth’s surface, anything that weakens it is allowing stains and decay to take root. Both of which can be found in coffee, which has a reputation for staining teeth. If you’re drinking lightly-flavored sparkling water in place of soda for the health benefits, we can’t fault you too much. After all, the calories, caffeine, and other harmful elements found in most sodas are largely left out of the increasingly popular sparkling waters. Unfortunately, however, you aren’t doing your teeth many favors; the high levels of carbonation found in even the most flavorless and unsweetened sparkling waters are still bad for your teeth as the carbon dioxide released from the tiny bubbles helps to produce acids and harmful bacterias in your mouth, which can lead to decay and staining. Still, if sipping sparkling water is all that is keeping you away from regular soda intake, this is better every single time. Yes, even cold water is bad for your teeth. Ice, in fact, is one of the absolute worst things you can subject your teeth to, and many people chew the ice cubes they use to chill their water with total disregard for the fact that they’re damaging their teeth in multiple ways at once. Even if you leave out the ice, drinking cold water causes your tooth enamel to weaken, which makes anything else you intake in the near future much more likely to develop staining or decay within the tooth. While acids, sugars, and staining elements are much worse for your teeth, any contact with an ice-cold beverage or ice itself is innately harmful to your teeth. All of the marketing campaigns and things your mother told you growing up were pretty much wrong: Milk isn’t actually that good for you, especially as an adult. Even if it were, it definitely isn’t the tooth-protecting drink you likely believe it to be; in fact, milk is commonly given to children in the evening, which has been shown to have numerous negative effects – including tooth decay. While the vitamins in milk do help to strengthen bones in growing children, those same vitamins can be found in other food sources, making milk a pretty weak option for improved oral health. Remember, milk is a cow’s growth serum for their baby calves, meaning that it naturally includes a surprising amount of energy-rich sugar as well as a host of immunizing bacterias, both of which promote tooth decay when left in our mouths. Sure, we left plenty of slightly to majorly harmful things off of this list, such as sports drinks, energy drinks, tea, and just about anything you can order in a drive-thru, largely because just about anything we drink is at least somewhat bad for our teeth in comparison to room temperature water. Any glass of water ranging from about 45 to 75 degrees Fahrenheit is infinitely better than any other beverage you could enjoy. For most of human history, this temperature of water was almost always the only thing we could enjoy; it is only in the modern age that we have transitioned away from mandatory water consumption and our mouths are simply not adapted to it. Do we fully expect you to avoid everything but 45 to 75 degree water? No, of course not. Instead, you should do your best to cut out the bad stuff – at least once a day – and always be sure to give your teeth the proper attention they need as laid out by your dentist. Likewise, you should make regular appointments at our Encino dentist’s office for regular screenings and cleanings. Just remember to make a note to schedule your next dental appointment when you’re sneaking a bite of ice cream before bed and your teeth should be just fine. Contact our friendly staff to set up your next appointment with our Encino dentist today!